Federal’s Gold Medal Match HV .22 Long Rifle ammunition is a favorite load of competitive rimfire shooters who appreciate its high-quality components and superb accuracy. 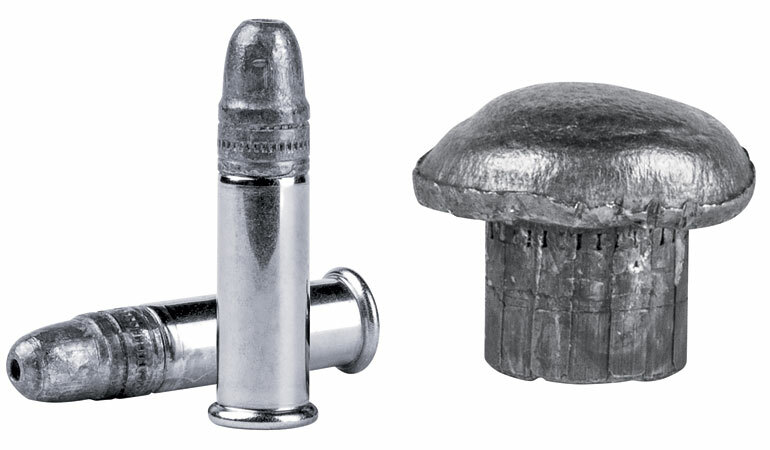 Federal is now offering a version of that round designed specifically for small game: the Hunter Match .22 Long Rifle. Hunter Match ammunition combines the hollow-core version of the lead bullet found in Gold Medal Match HV ammo with a nickel-plated case for smooth, reliable feeding. I tested the round in a vintage Winchester Model 75 Target with a 28-inch barrel topped with a Leupold 2-7X scope, and the results were impressive. After firing five five-shot groups at 50 yards, the smallest cluster of shots measured .37 inch, the largest .61. The overall average was .44 inch. That’s impressive for factory ammunition with a suggested retail of $8 per 50 rounds. Average velocity for 10 shots over a ProChrono chronograph averaged 1,139 fps when measured 10 feet from the muzzle with a standard deviation of 14.1. I had a chance to push ranges a bit farther at a media event where we shot targets out to 118 yards from field positions. Even so, it was not difficult to keep the four-inch steel plate spinning as the ringing echo of lead slapping steel rang down the canyon walls. In addition to its accuracy potential, this is also a clean-burning round. There was significantly less fouling in the chamber and bore of my Model 75 than what you can expect from some bargain basement .22 ammo.